From Paramount Pictures and Hasbro comes the first teaser trailer and poster to the upcoming Transformers spin-off, Bumblebee. The live-action, Michael Bay directed, Transformers franchise has been going since 2007, with last year seeing the highly disappointing fifth instalment, Transformers: The Last Knight attempt to storm the box office. Bumblebee follows the fan-favourite, yellow-and-black Autobot on the run in the year 1987, after being discovered in a scrapyard by teenager Charlie, played by Hailee Steinfeld. From what we can see in the trailer, the movie seems to focus more on the friendship between those two characters, rather than the relentless battles of the previous movies. 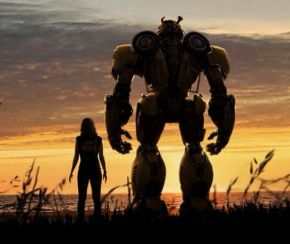 Bumblebee is being directed by Travis Knight, who previously blew audiences away with the fantastic Kubo and the Two Strings, with a screenplay from up and coming writer Christina Hodson. Michael Bay is still involved as Producer, which may not be the best news for fans hoping to see the series move away from his style of filmmaking, but from the look of the trailer, it seems he may not have had too much influence over the film. The trailer also hints at the usual government interference, with a quick glimpse of former wrestler John Cena as an agent. It has been confirmed that Sector 7 will also be making an appearance, which will tie into the first movie. Fans of the animated series will no doubt be pleased by the look of Bumblebee himself, with the design being more rounded, looking closer to the cartoon. There is even a really cool shot of, what looks like, Starscream in a forest, who hasn’t been seen since Dark of the Moon. Bumblebee looks to be a much smaller movie than we’ve seen, since any of the other Autobots, such as Optimus Prime, have only been rumoured for cameos, rather than important roles. The film has been likened by its producers to The Iron Giant, which can only mean good things going forward. Maybe a Transformers movie with a heart and emotion is just what we need. Bumblebee will be released 26th December 2018.